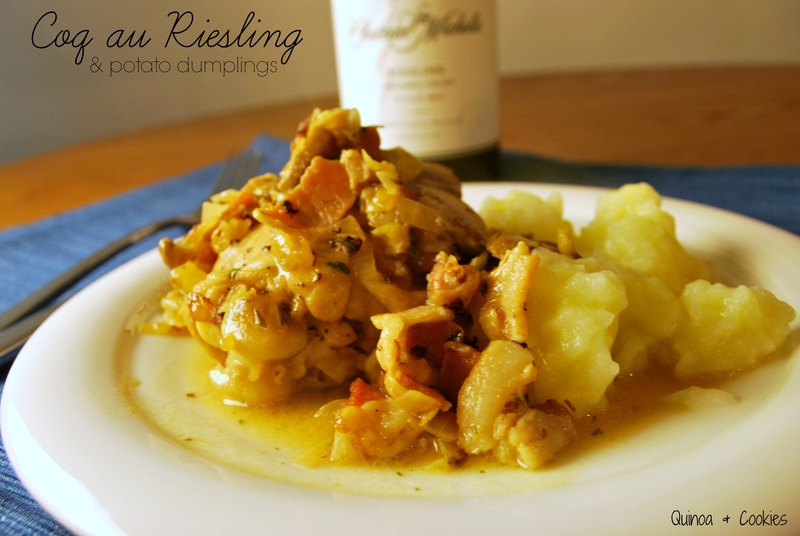 Chicken cooked in a Riesling sauce, served over potato dumplings. Yeah, I’d go to Luxembourg. In our latest expedition for Around the World, I was excited to be back in Europe. Yes, the whole point of this experiment is to try new cuisines, but at the same time I was happy to recognize all of the ingredients being discussed. For those who don’t know, Luxembourg is a tiny country — about 1,000 square miles, or roughly half the size of Delaware. Bordered by France, Germany, and Belgium, it takes the best aspects of these cuisines and rolls it up into a ball of tasty. And knowing how much I loved cooking French and German foods, you’ll understand how eager I was to get going on Luxembourg. When I started researching, the first thing to jump out at me was the amount of Riesling used in the recipes. After a Google search or two highly scientific study, my dad determined that Riesling goes with everything. And our follow up experiments, which involved pairing Riesling with all sorts of foods, seemed to confirm his conclusion. So cooking with it had to end well! 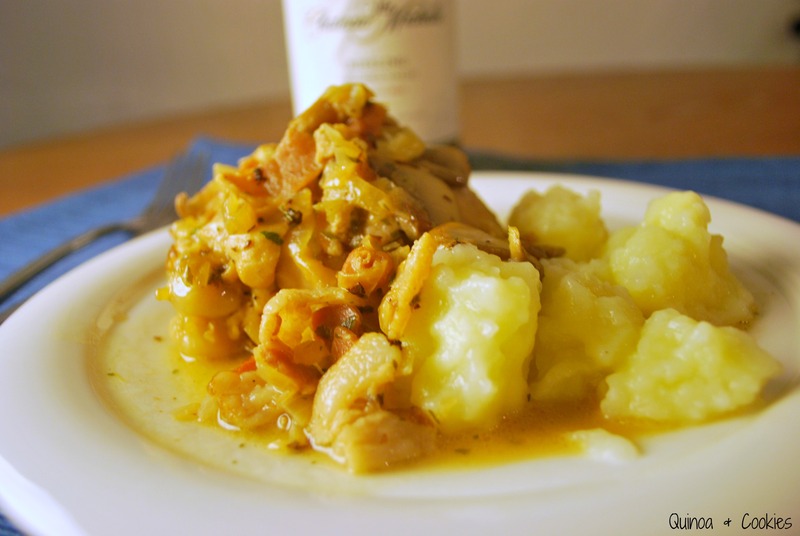 I decided to make Coq au Riesling, which is essentially a French Coq au Vin made with a German wine. 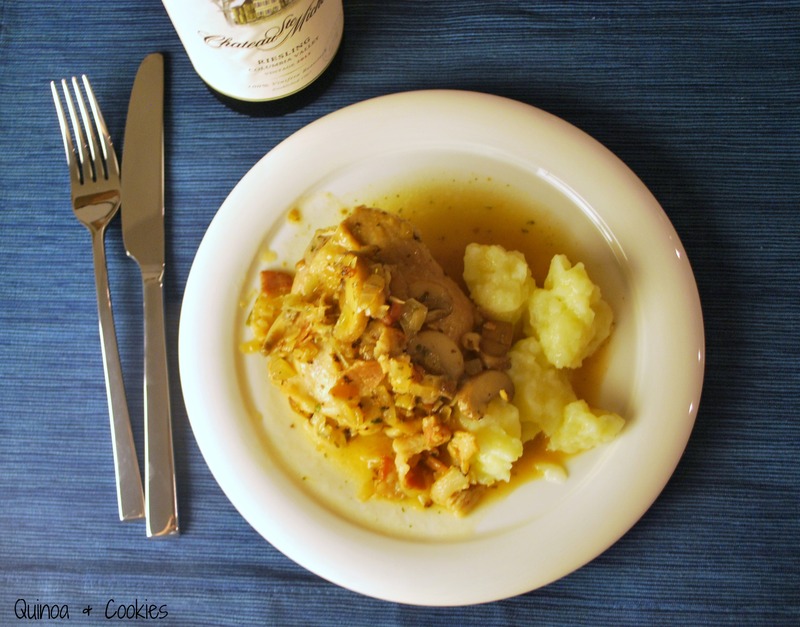 The sweetness of the wine really permeates the chicken. The mushrooms are velvety, and the bacon is, of course, perfect. But as much as we liked the chicken, my husband and I both LOVED the potato dumplings. Although I had made dumplings once before, I preferred the results this time. All things considered, Luxembourg was a huge success. And as I said, Riesling goes with everything, so when you make this remember that a glass is pretty much a mandatory accompaniment. Up next is Malawi; Toto, we’re not in Europe anymore. Melt butter and oil together in bottom of a cast iron pot over medium heat. Brown the chicken pieces on all sides and remove from pot. Add the onions and bacon, and fry together until the onions are translucent and the bacon has cooked out most of its fat. Add the garlic and cook until fragrant. Remove from pan, leaving fat in the pot. Add the mushrooms, parsley, and pepper, and sauté for about five minutes, until the mushrooms start to release their juices. Put the chicken and onion mixture back into the pan, and stir. Pour wine over the food and bring to a boil. Once it is boiling, cover, lower heat to a simmer, and cook for 15 minutes. After the fifteen minutes, remove the lid, turn up the heat, and add the milk. Cook for another 10-15 minutes. Serve hot, over potato dumplings. The photo might be a bit glare-y, but these dumplings are fantastic! Bring a large pot of water to a boil, and salt generously. Combine all ingredients, adding more potato starch as necessary to make it thick enough to form a dough. Transfer dough to a floured work surface. Take pinches of dough and form into 1” balls. Boil dumplings for 20 minutes, or until done (they will float to the top, and when you cut them open will have a solid consistency throughout). Remove with a slotted spoon. Hungry for more? Follow me on Pinterest! Like Quinoa & Cookies on Facebook! Quinoa and Cookies, right to your inbox!